Milan, 14 October 2016. Prysmian Group, world leader in the energy and telecom cable systems industry, has been awarded a contract – worth up to 13 M euro – by Tideway B.V. for the Rentel offshore wind farm project. Rentel N.V. was founded by a consortium of Belgian specialists in renewable energy with a significant track record in offshore wind, who have joined forces to develop, finance and operate the Rentel offshore wind project, which holds a 309 MW offshore wind concession in the Belgian North Sea. The Rentel wind farm is located approximately 34 km from the Port of Zeebrugge and approximately 40 km from Oostende off the Belgian coast. It will consist of 42 Siemens D7 type wind turbines and will produce nearly 309 MW at its peak, supplying CO2 friendly electricity to 285.000 households. The project will become the fifth offshore wind farm to be constructed within the Belgian North Sea, and shall contribute to Belgium’s leading role within offshore wind energy towards achieving EU climate standards and increasing the security of energy supply in Belgium. Prysmian is responsible for the design, manufacture and supply of the 33 kV submarine cables in various cross-sections, together with the related cable accessories. Prysmian will also provide the offshore cable termination and testing services. The cables will be produced in the Prysmian facility in Drammen, Norway, one of the Group’s centres of excellence for submarine cables. The cables are planned to be delivered in summer 2017, whilst the termination works are scheduled to be completed in Spring 2018. Over the years Prysmian has moved ahead with major investments in new and upgraded manufacturing and installation assets, broadening the range of its offered products and innovative technologies, strengthening its services and capabilities in production and project execution in order to serve the offshore wind market and support the demands of this growing industry as a trusted and dedicated partner, whether for medium voltage inter-array cables, HVAC or HVDC export cable needs. Recently the Group has announced the launch of its EPR insulated 66 kV cable solution for inter-array application, the first at this voltage level, enabling up to 15% cost reductions for offshore wind farms. Prysmian operate three production facilities dedicated to submarine cables, situated in Arco Felice (Italy), Pikkala (Finland) and Drammen (Norway), as well as three installation vessels, Giulio Verne, Cable Enterprise and the newly procured Ulisse, together with proven in-house cable protection equipment and specialised operations teams. Rentel is part of the Otary partnership, uniting various Belgian specialists in renewable energy including investment and development companies Rent-A-Port Energy and Power@Sea, dredging and marine engineering specialist DEME and its subsidiary DEME Concessions Wind, green energy producers Aspiravi Offshore II and Elicio, the Walloon environmental holding SRIW and Wallonia Offshore Wind as well as the Flemish and Walloon energy and utilities participation companies Z-Kracht and Socofe. 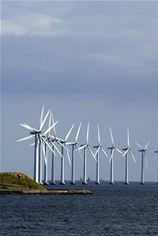 In addition to the Rentel concession, Otary also holds the concession for construction of the offshore wind farm Seastar and is part of the consortium developing the Mermaid offshore wind farm.